Hey Angel! 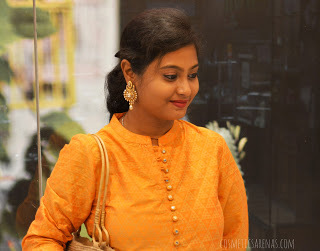 It is time to review the newly launched Ikkai by Lotus Herbals Almond Face Scrub. 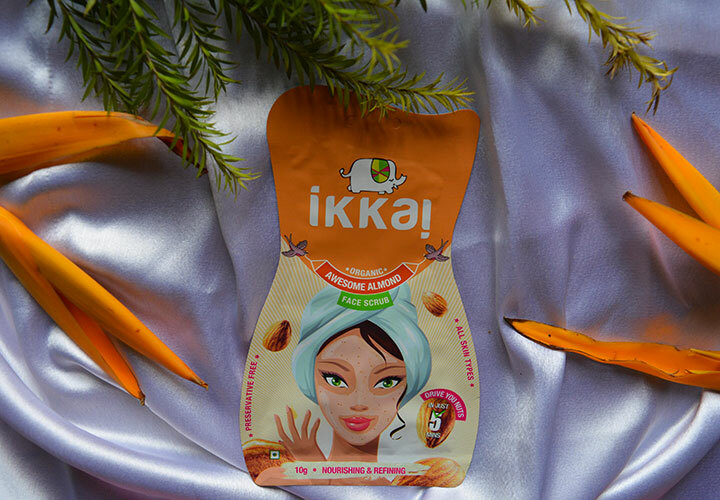 So, Ikkai is a single-use range of beauty products from the house of Lotus Herbals. Recently a range of Papaya, Orange, Almond, and Chocolate based Ikkai products have been launched by Lotus Herbals. Basically, in Japanese language, Ikkai means one time, so the name justifies the purpose of the products quite well. I have used this product several times. So, without further ado, let me share my experience with Ikkai by Lotus Herbals Almond Face Scrub. 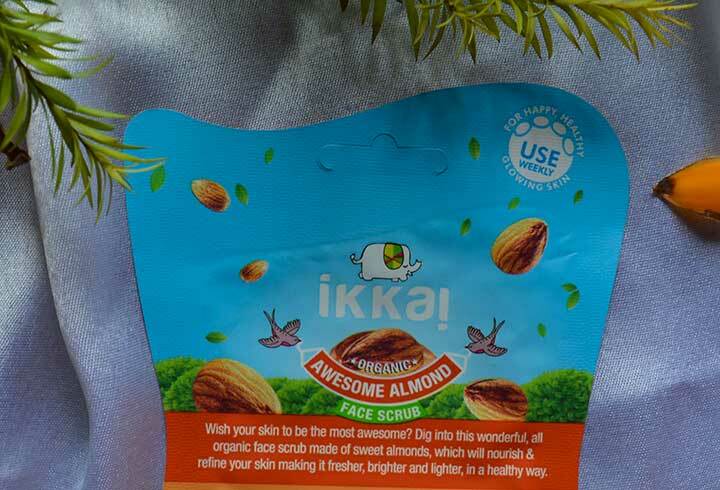 What Does the Brand Claim about Ikkai by Lotus Herbals Almond Face Scrub? Do you wish your skin to be awesome? 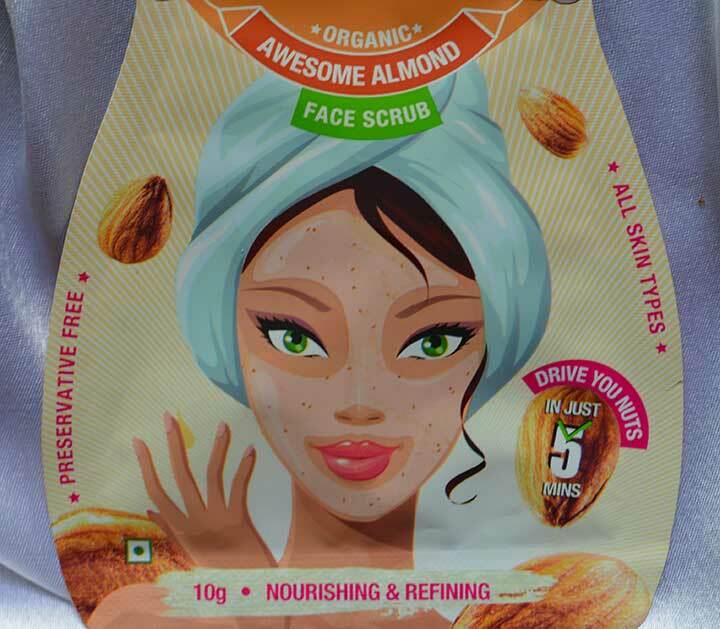 Then you need to dig into this wonderful, all organic face scrub that is made of sweet almonds. Almonds would nourish and refine your skin; and would leave a fresh, bright, and light skin behind. This is just a 3 step face scrub. It would help you to combat the effects of stress, pollution, and an unhealthy lifestyle. 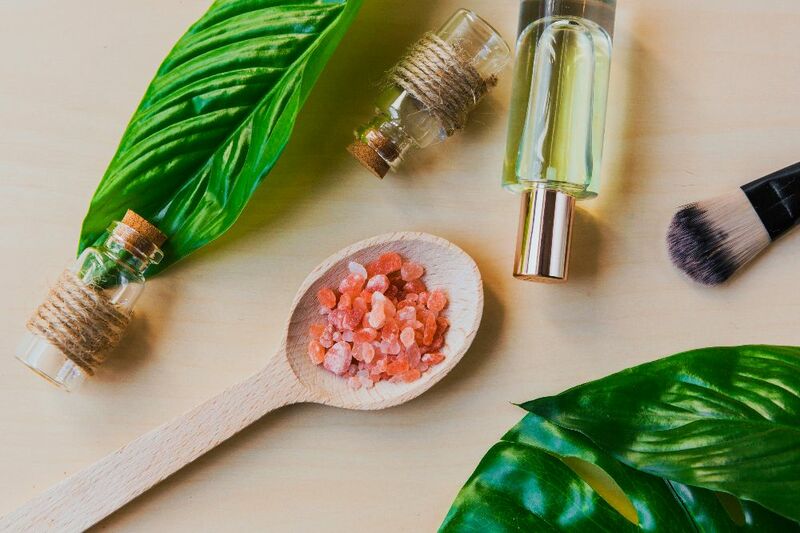 Indulge in this cruelty-free and eco-friendly skincare range and let your skin thank you. Well! Lotus Herbals has labeled all the ingredients clearly on the pouch. In fact, they have mentioned the source or the nature of the ingredients within brackets. This particular approach would remind you of the brand The Body Shop. 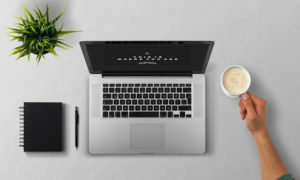 It becomes easier to analyze the components while you already know the functionality of the components within the formula. 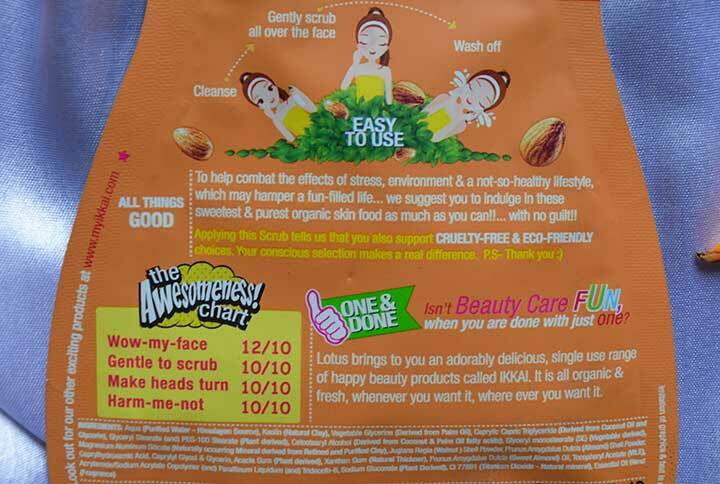 Now, let’s decode the ingredients of Ikkai by Lotus Herbals Almond Face Scrub. Aqua or Purified Water (Himalayan Source): It is a creamy product where water is the foundation. Lotus has used water sourced from the Himalaya, which is quite stunning. 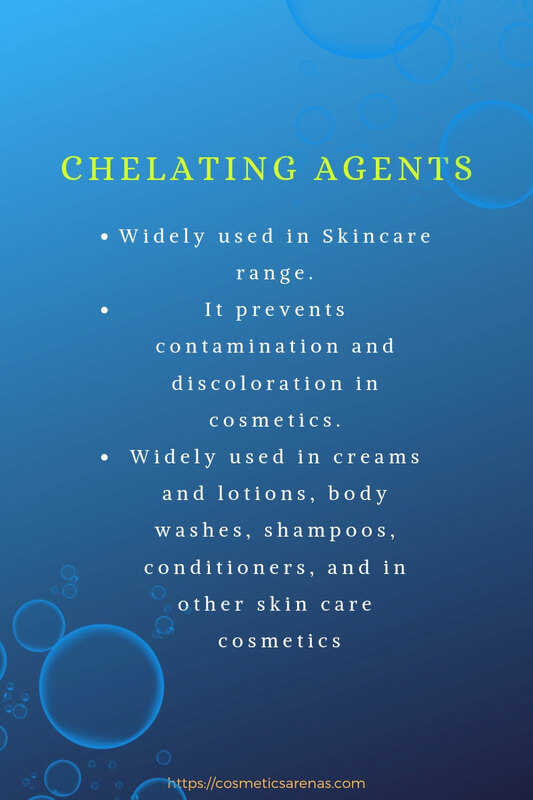 Kaolin (Natural Clay): All clays are beneficial for skin. 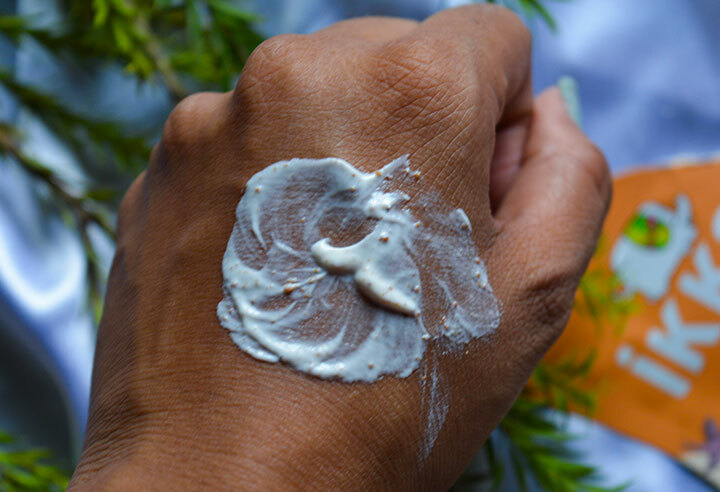 Kaolin clay is a boon for oily skin for its oil absorption power. 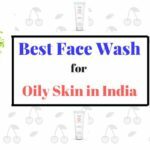 It can deep cleanse the pores and detoxify the skin. I can treat acne and is a great exfoliator. Vegetable Glycerin (Derived from Palm Oil): Glycerin is a great humectant that locks moisture inside. Honestly, I expected a better source for this component. 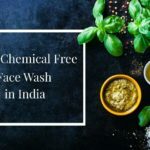 Caprylic Capric Triglyceride (Derived from Coconut Oil and Glycerin): It is an absolutely safe ingredient that is used as a fragrance and skin-conditioning agent. Glyceryl Stearate and PEG-100 Stearate (Both are Plant Derived): This is a combination of two emulsifiers that make sure to bind the formulation. Emulsifiers are mainly used to bind oil and water. Cetostearyl Alcohol (Derived from Coconut and Palm Oil Fatty Acids): It is another emulsifier that also thickens the formula. Magnesium Aluminium Silicate (Naturally Occurring Mineral Derived From Refined and Purified Clay): It is a naturally occurring thickener that is white in color and mostly used as viscosity controller and absorbent. Almond Shell Powder: This is probably one of the best exfoliators. The soft edges of almonds make them ideal to use as exfoliators. Caprylhydroxamic Acid: It is an amino acid derivative from Coconut Oil. It is used as a broad spectrum anti-fungal agent and as a preservative in cosmetics. This is a newly discovered alternative to PARABENS, so very limited data are available right now about its safety. Caprylyl Glycol and Glycerin: It is thought to be a safe preservative. It is generally derived from Coconut. Though the source is not mentioned here. Acacia Gum (Plant Derived): It is a moderately safe ingredient that is used as an adhesive and fragrance ingredient. Xanthan Gum (Natural Thickener): It is a safe ingredient that is used as a binder and emulsion stabilizer. Basically, it is a thickener in cosmetics. Sweet Almond Oil: This is a boon for flawless skin. It can remove tan, can treat acne and pimples. 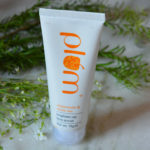 It is a great exfoliator too that can cleanse the skin in-depth. Moreover, this is an excellent anti-aging ingredient that occurs naturally. Vitamin E or Tocopheryl Acetate: It is an excellent anti-oxidant and moisturizer. Acrylamide/Sodium Acrylate Copolymer: This component is actually a probable human carcinogen (that can cause cancer). Honestly, I was not expecting this ingredient in the formula. EWG has rated this component totally hazardous. Here is the proof. Parafinium Liquidium: It is actually an emollient that is generally followed by Mineral oil. Trdeceth-6: It is a surfactant that is generally derived from Vegetable oil. It is an absolutely safe ingredient. Sodium Gluconate (Plant Derived): It is a safe chelating and skin-conditioning agent. CI 77891 (Titanium Dioxide – Natural Mineral): This component is a UV filtering ingredient that is generally used in Sunscreens. Many cosmetologists consider this component as a safe alternative to Zinc Oxide. 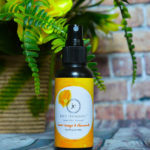 Essential Oil Blend (Fragrance): Well! That’s impressive indeed. But, I could have become much happier if I had known the names of the Essential Oils. Alright, so that’s all! Honestly, I am having a mixed reaction about the ingredients as a whole. The presence of a few components like Kaolin Clay, Sweet Almond Oil, Caprylhydroxiamic Acid, Caprylic Capric Triglyceride is quite stunning. Whereas the presence of Acrylamide is compelling me to take this product seriously for its adverse effects. This ingredient can give you some serious health hazards. So overall, I am afraid that I would not be able to rate this product, more than 3 out of 5. The packaging is totally travel-friendly. It would last you at least 10 usages, which is awesome. The packet is plastic-made and cannot be torn easily. The colorful packaging would leave you stunned; it is indeed beautiful and captivating. 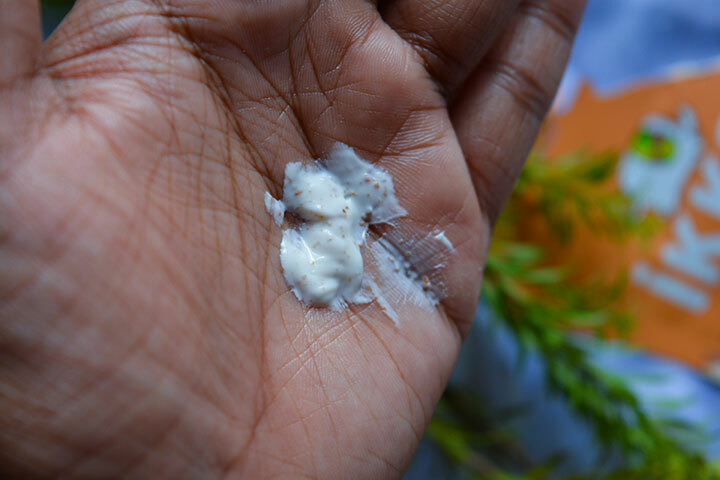 The texture of Ikkai by Lotus Herbals Almond Face Scrub is creamy and off-white in color. There are a plenty amount of almond and walnut shell particles in the formulation. It is easy to spread and apply. If you remember the smell of Boroplus, then this is what the aroma is. Exactly! At least for me, the aroma is nothing exceptional or fantastic. I have used Ikkai by Lotus Herbals Almond Face Scrub at least 4 to 5 times. The application is same as any general face scrub. After all these usages, I felt that it does the job of exfoliation quite well. But, there was nothing extraordinary! I have been a great fan of Lotus Herbals Berry Scrub for a long time. And, this product particular has similar functionality to the Berry Scrub. Honestly, I could not notice any glow or brightness after applying it. It would not irritate your skin though, which is a good sign. A number of amazing ingredients. An abundant amount of scrubbers are present in the formulation. A small amount is required every time; a single packet can be used at least 10 times. Acrylamide is a carcinogen. Its presence made the formulation only worse and horrible. After tearing the packaging, you need to tie the opening part, otherwise, the scrub may come out. Nothing innovative. Just like pouring a bottle of an old wine in a new packaging. Ikkai by Lotus Herbals Almond Face Scrub is a paraben-free formulation that is definitely a new range of product. But ultimately, there was no such innovation involved. 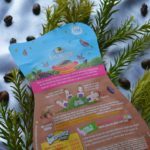 So, if the product packaging and travel-friendliness are what you are attracted to, then you can definitely try at least one Ikkai product. But otherwise, keeping in mind the ingredients, it would not be a great choice of skin care product to buy. 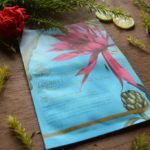 Would I Repurchase Ikkai by Lotus Herbals Almond Face Scrub? Absolutely not! I would rather stick to natural apricot kernel powders. Would I Recommend Ikkai by Lotus Herbals Almond Face Scrub? As an honest blogger who takes ingredients more seriously than any other thing, I would not recommend this product. The presence of a carcinogen is making me crazy right now. That’s all for today! Thank you for reading. If you like reading it, then don’t forget to subscribe to Cosmetics Arena. Take care; much love. I would come back soon with another post. 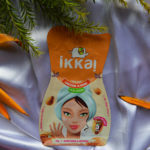 Just the other day I saw these Ikkai products on Nykaa and was so tempted to buy them, just because that packaging is so sooo cute 😀 But then I thought, let me wait for the reviews to pour in and not just get enamored by lovely packaging..good decision for me 😀 Great review!